The annual health policy forum is fully underwritten by the Foundation for a Healthy Kentucky to enable broad community participation. 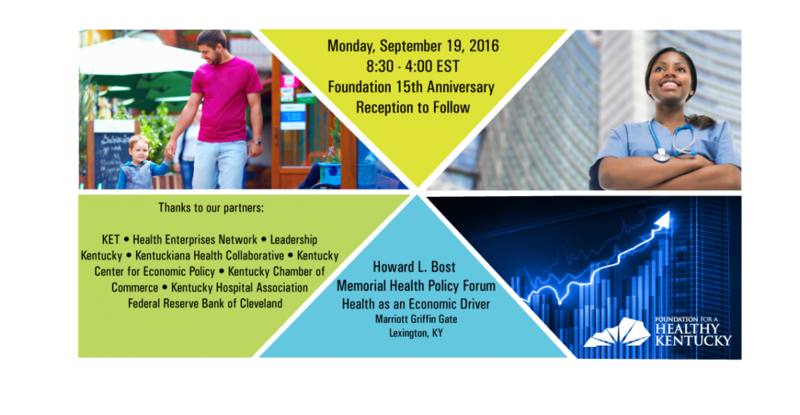 It will be held this year at the Marriott Griffin Gate in Lexington on Monday, Sept. 19, 2016, from 8:30 a.m. to 4 p.m. Afternoon breakout sessions will be led by health and economic policy experts, health advocates and community health providers, including Elizabeth Cobb of the Kentucky Hospital Association; David Cooke, Grow Appalachia; Randa Deaton, Kentuckiana Health Collaborative; Ellen Hahn, Center for Smoke-free Policy; Michael Karpf, UK Health Affairs; Glen Mays, UK College of Public Health; former Kentucky Health Policy Director Emily Parento; Doran Schrantz, ISAIAH (a Minnesota faith-based coalition focused on healthy communities); and Bill Wagner, Family Health Centers. Dr. Glen Mays will be leading the sessions on "Health Care as Employer" from 1:15 to 2:30 pm and again from 2:45 to 4 pm. A full agenda with speaker bios will be available on the Foundation’s website shortly. There is no cost to attend the Bost Forum, but advance registration is required and no-shows are charged a fee.